Your 3dcart store includes a built-in Tax Manager that allows you to specify tax rules based on the order's "Ship to" zip code. Look towards the "Tax Manager" section in the middle of the page and click on "Setup Tax"
In the "Zip From" and "Zip To" fields, type a range of zip codes you would like the tax be applicable to. If these fields are left blank, then the tax rate will apply to the entire region you have selected for the Country and State fields. Enter your tax percentage in the "Tax %" field. Click the "+Add" button at the top right of the section to complete the steps. Your tax rules are now set up. By default tax rates are applied ONLY to the product being ordered. Checking this box will apply tax rates to order's Shipping Costs on top of the order amount. Once you have inserted the tax, you will also see an option where you can enter a Tax Code. This option would be applicable only if you need to set up a different tax rates on a per product basis. For example, in some areas food items are taxed differently than material goods. For these situations, you would create tax codes which can then be applied to your products (Using the product's Advanced Tab). 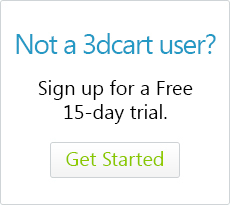 For more information on charging different tax rates on products using 3dcart's Tax Manager, please click here. If you'd like to remove a tax range, look towards the far right of the added range and click on its "Action ->Delete" button. If you are using an Advanced and 3rd party Tax solution such as Avalara, SpeedTax or TaxCloud, please be sure to remove all ranges that are created with 3dcart's Tax Manager to avoid any possible conflicts.